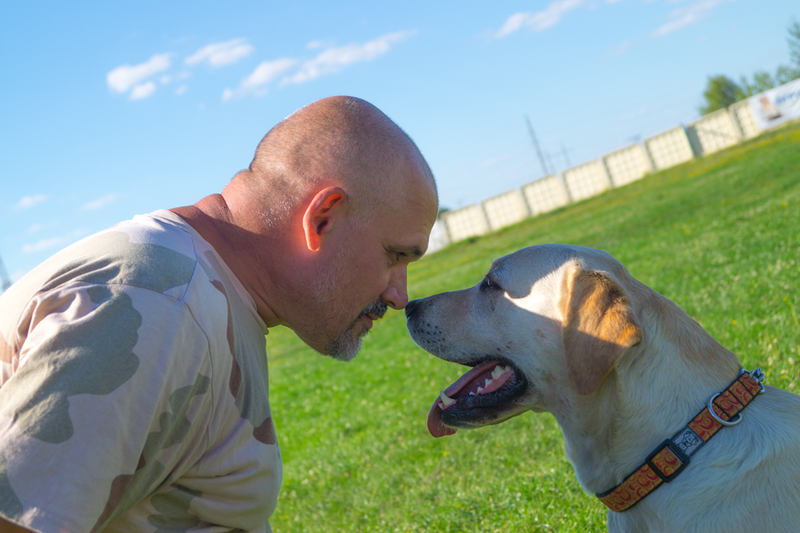 In September 2015 Ukrainian Echo published an exclusive piece about Hero’s Companion, a new Ukrainian-Canadian project which helps to address the growing need for psychological rehabilitation in Ukrainian veterans using the power of man’s best friend – dogs. In this follow-up piece, Hero’s Companion Director Kalyna Kardash gives us an update on the project’s progress and plans for the future. “I’m going to kill him, does he know how easy it is for me to get a gun these days?! I’ll show him..!” It’s 9:40 a.m. on a rainy Sunday morning in Kyiv. We’ve been waiting for half an hour for this last veteran to arrive so that the group can begin its Tomatis therapy session. “Ok Oleh, first we need to calm down, take a few deep breaths and tell me what is making you so upset,” says the young therapist presiding over the session, gently making her way over to him and placing down a chair. That morning Oleh had had a misunderstanding with his wife, allegedly catching her cheating on him. Kora, my service dog in training who regularly works as a therapy dog in Kyiv, instinctively trots over to the distraught veteran, plopping herself down next to his feet. Automatically he reaches down to pet her. At first his movements are brisk, imbued with frustration as thoughts obviously continue to race through his mind. “Just keep focusing on the dog,” I tell him as I get Kora into position for him to work on a breathing exercise with her. Eventually he picks Kora up, placing her in his lap, which makes for a bit of a funny sight as she, being a Golden Retriever, is not exactly small. But by this point Oleh has calmed down, and we are able to begin the session. Situations like these aren’t uncommon, one psychotherapist tells me. Many soldiers find the return home difficult, as much, including themselves, has changed while they were away. Divorce rates among veterans tend to jump significantly, as do broken down familial relations. Since the Russian invasion of eastern Ukraine began in April 2014, over 250,000 soldiers have taken part in the Anti-Terrorist Operation. Over 110,000 have already been demobilized, a number that will steadily climb as time goes on. Of these 110,000 it is estimated that at least 30 percent suffer from psychological injuries as a result of time spent in combat operations. For many, integrating back into civilian life has proven more difficult than imagined, often shadowed by the invisible but very real effects of Post-Traumatic Stress Disorder (PTSD) and other psychological injuries. Left untreated, these mental health issues can lead to economic marginalization, poverty, substance abuse, and violent behavior. This is where Hero’s Companion, together with other non-profits, has stepped in to fill a void that an unprepared Ukrainian government was ill-equipped to handle. Hero’s Companion is the first and only organization of its kind in Ukraine, and operates in two areas: service dogs and therapy dogs. Service dogs are highly trained dogs, specially prepared for one individual with whom they constantly live with. Therapy dogs, on the other hand, are dogs that belong to individuals who volunteer their time by visiting hospitals, rehabilitation centres, veteran houses, and other establishments with their certified dog. While service and therapy dogs are a relatively well known concept in North America, the opposite is true in Ukraine. During my time in Kyiv I tried to get out in public as much as possible with Kora, in part to further develop her training as a service dog, but more importantly to raise awareness about the role service dogs can play in the lives of injured veterans. It was also a useful public awareness experiment, seeing how onlookers would react to a dog wearing a service vest. In most cases people were quite accepting of the dog, and some restaurants even offered her a bowl of water. Other times, however, she was categorically denied entry, such as the time we tried to enter the Globus shopping centre in downtown Kyiv. After a few more minutes of us trying to explain to him what a service dog is, we realized it was futile and the only way of solving the problem was to take his advice and write a letter to the owner of the mall. While a bit discouraging, such incidents did not stop us in our determination to further develop our service and therapy dog programs. 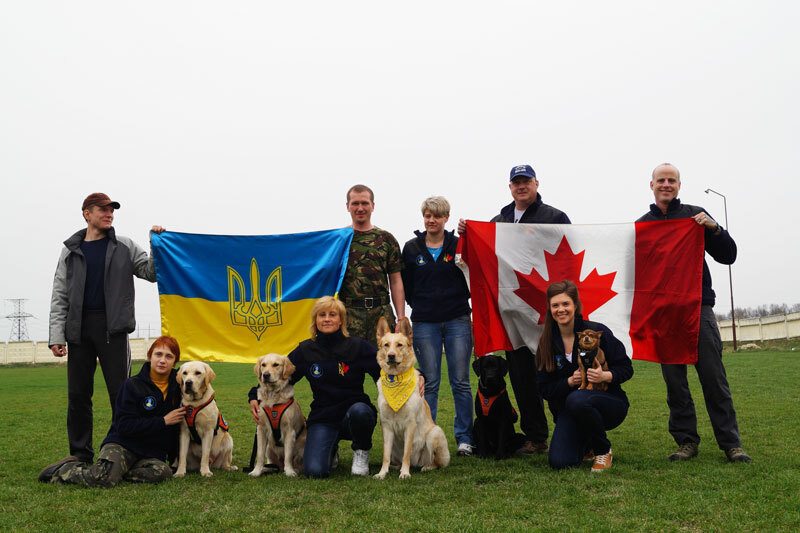 In April, Hero’s Companion conducted its second Canadian-Ukrainian training mission, during which two Canadian trainers came to Ukraine for ten days to continue preparing our core team of Ukrainian service dog trainers. It was also during this mission that a new veteran-service dog team was welcomed and began their training. Perhaps most noteworthy of all of the project’s developments over the past few months is the expansion and popularization of its therapy dog program. When we first started the program we were often told that it was “very unlikely” that we would get access anywhere indoors at medical institutions servicing soldiers and veterans. And indeed, at first there were difficulties; we were not allowed into hospitals, and medical professionals were skeptical of the concept that dogs would be beneficial in the recovery and rehabilitation process. Our first therapy dog visits took place outside in a hospital courtyard. After hospital staff realized the popularity of these visits (along with some persuasive lobbying by our side), they allowed us into a ward at the Main Military Hospital in Kyiv. To our knowledge, this was the first time something like this had happened in Ukraine. Since then, and thanks to the openness and acceptance of psychologists, doctors, and volunteers, we have established partnerships with a variety of health centres and rehabilitation programs for veterans in Ukraine. To meet growing demand our therapy dog program also expanded, adding 7 new dogs to our roster, bringing the total up to 10. While the program was originally begun with the goal of helping injured soldiers and veterans, the idea of dog therapy has gained momentum and is spreading to other areas. 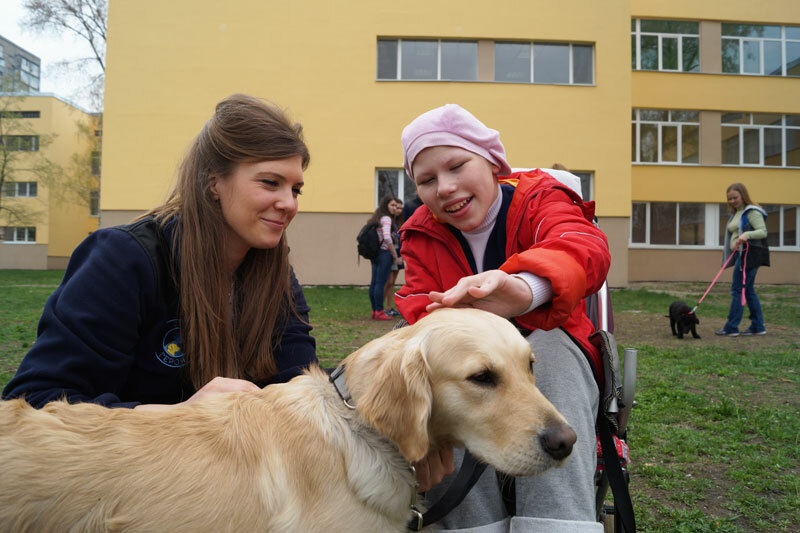 In addition to working with soldiers, Hero’s Companion volunteers have visited schools with special needs children and have been invited to participate in festivals with our fan-favourite canines. Caregivers and onlookers are often amazed at the effect the therapy dogs have on the children. The positivity and joy evoked by the presence of the dogs, which leaves a lasting impression, is perhaps the strongest argument in favor of this new form of therapy in Ukraine. In one instance, we were visiting a school which had many special needs children in its student population. One of the students, Anya, had cerebral palsy and was bound to a wheelchair, unable to speak or otherwise communicate effectively. Her grandmother, who was with her at the time, told us that Anya had been afraid of dogs her whole life. Initially Anya shied away from the dogs, but after seeing how gentle and friendly they were took interest, first petting the dog’s back, and eventually working up to the dog’s face and ears. By the end of our visit Anya even insisted on holding onto the leash, having the dog walk beside her wheelchair as her grandmother brought her back inside the school. The ongoing war in Ukraine has forced the Ukrainian government and its society to create new institutions and practices to care for thousands of veterans and injured soldiers. In its efforts to come up with the necessary services as quickly as possible, Ukraine has turned to the West, learning from its lessons and best practices. It is in large part this new mentality, one more welcoming of change and new methodologies, which is a primary reason why Hero’s Companion has been able to make the inroads that it has thus far. But there is a greater, possibly more powerful reason why we have never been turned away by the veterans and soldiers the program is aimed at helping. As has been observed so often on the front, Ukrainian soldiers relish their time with their four-legged companions, often strays or those left behind by fleeing civilians. It is this natural bond between soldier and canine that Hero’s Companion has striven to capitalize on. 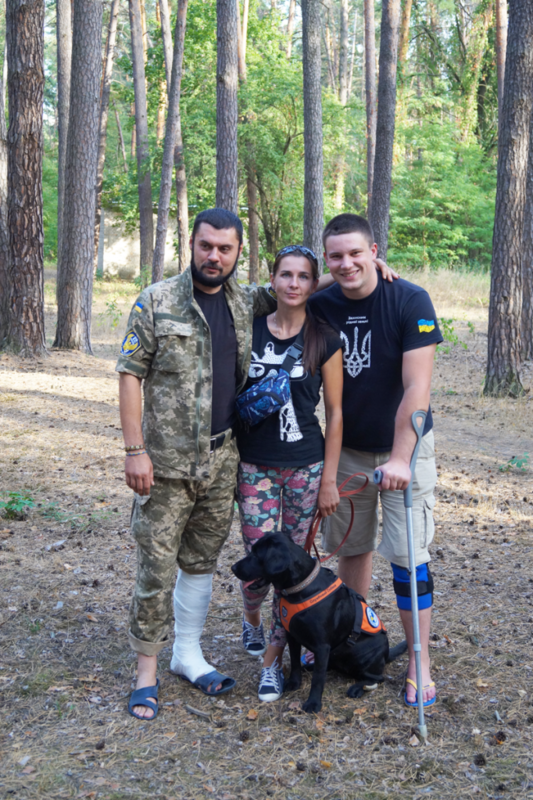 And as experience has shown us, the power of the human-canine bond transcends the battlefield and can continue to be a powerful instrument when collaboratively used in the healing journey of hundreds, if not thousands, of injured Ukrainian soldiers. Originally printed in Ukrainian Echo newspaper. 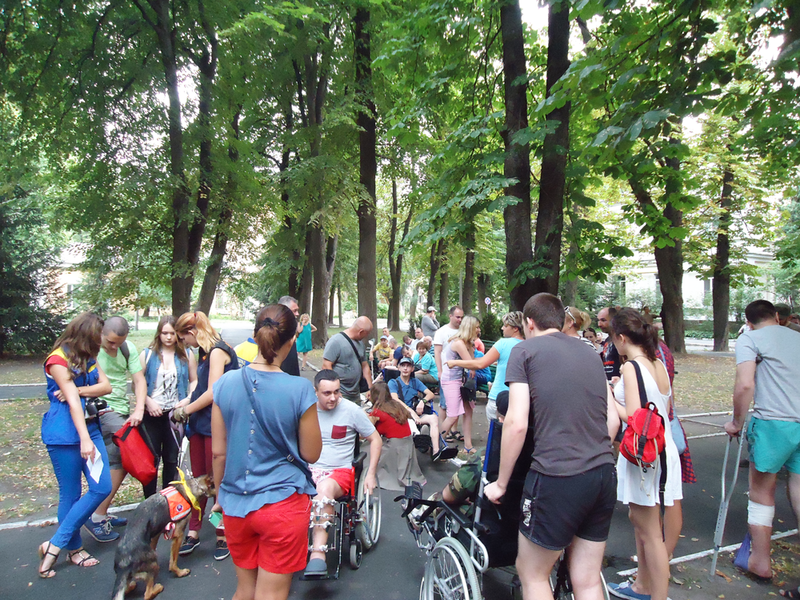 In this post, Hero’s Companion Project Director Kalyna Kardash reflects on the project’s inaugural three week mission to Ukraine in August 2015. 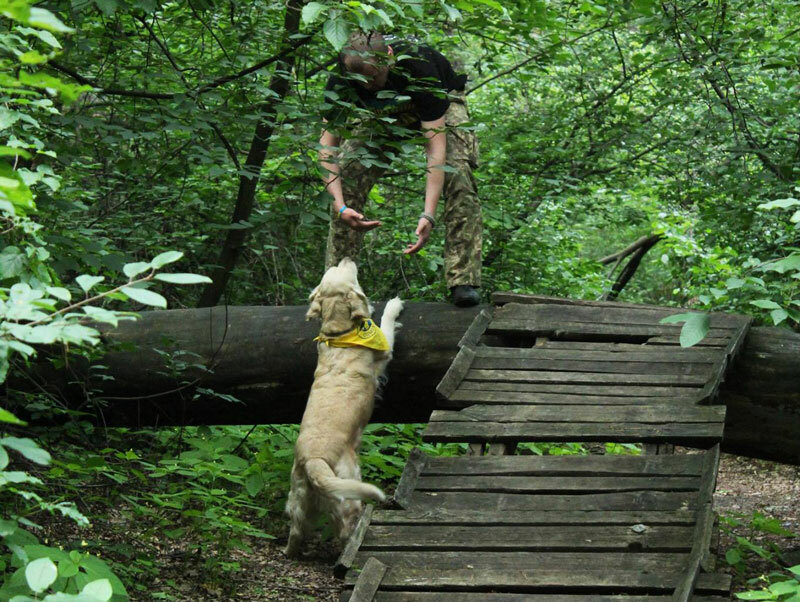 This summer saw the official launch of Hero’s Companion, a project of Guardian Angels Ukraine which trains and pairs service dogs for veterans and soldiers of the Ukrainian Armed Forces and volunteer battalions. Or at least this was the plan when the Canadian contingent first arrived in Ukraine. In a matter of three short weeks the project had expanded to also include a therapy dog program. To help launch the program, four trainers from the Canada and myself headed to Ukraine. It is worth noting that three of the four trainers have their own service dogs. After our initial assessments it was obvious that awareness raising would be an important component to the project’s success in Ukraine. 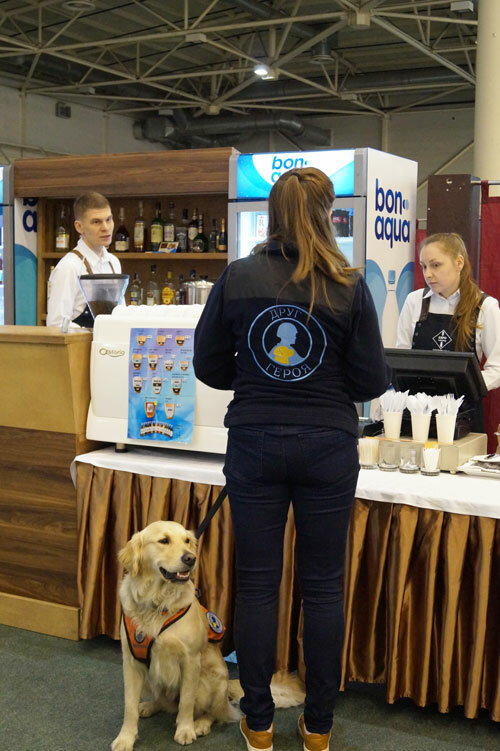 Very few people were aware of what a service dog was and how it could help returning Ukrainian soldiers suffering not only from physical injuries, but psychological ones as well. To help address these concerns, and what later came to be a growing demand for canine-assisted therapy, it was decided that Hero’s Companion would add a therapy dog component to their program, which is how Courageous Companions began in Canada. It is important here to note the difference between a therapy dog and a service dog. Whereas a therapy dog is meant to be pet, played with, and generally handled by several different people, a service dog is specifically trained for one particular veteran. The service dog stays with that veteran 24/7, and is not to be distracted from being focused on him. A therapy dog, on the other hand, is used by its handler to help numerous individuals open up and assist caregivers in supporting the sick and injured. The training time is also significantly different between the two types of dogs; whereas a therapy dog can be trained in a relatively short period of time (a few days to a couple weeks), a service dog and its handler go through over a year of intensive training and testing. In both cases, however, the dogs are tested to high standards before they can begin working as either therapy or service dogs. The first few days at the training centre also revealed a desperate need for highly trained explosive detection dogs. 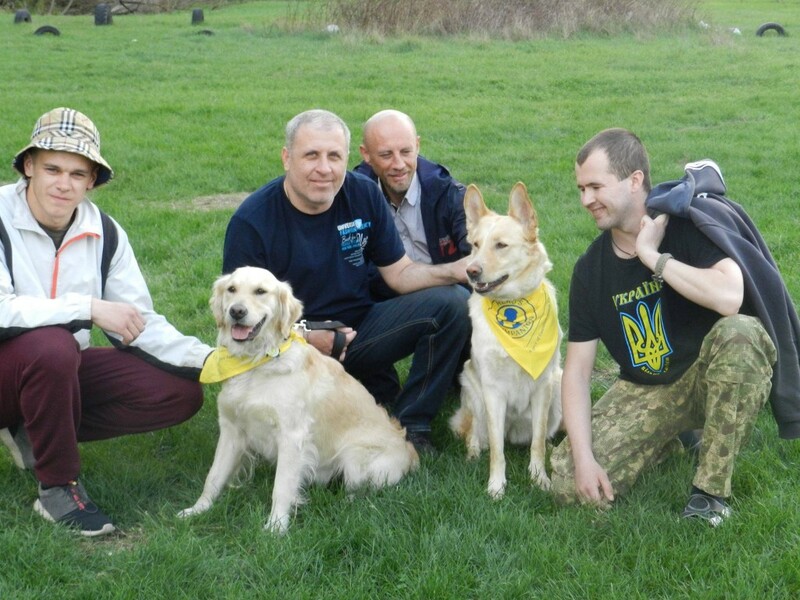 Anatoliy Trubchaninov, the head of our Ukrainian partner, Kinologen-Samariter-Bund der Ukraine (Spilka Samaritian Kinolohiv Ukrainy), had already been voluntarily training explosive detection dogs (and their handlers) for work at the front. These dogs are performing vital work such as detecting explosive materials at checkpoints and helping to find mines planted by Russian-backed terrorist forces. Since Russia’s invasion of Ukraine in the spring of 2014, it is estimated that hundreds, if not thousands, of land mines have been purposely planted by Russian-separatist forces. Such mines have not only been seriously maiming and killing hundreds of Ukrainian soldiers, but Ukrainian civilians as well. 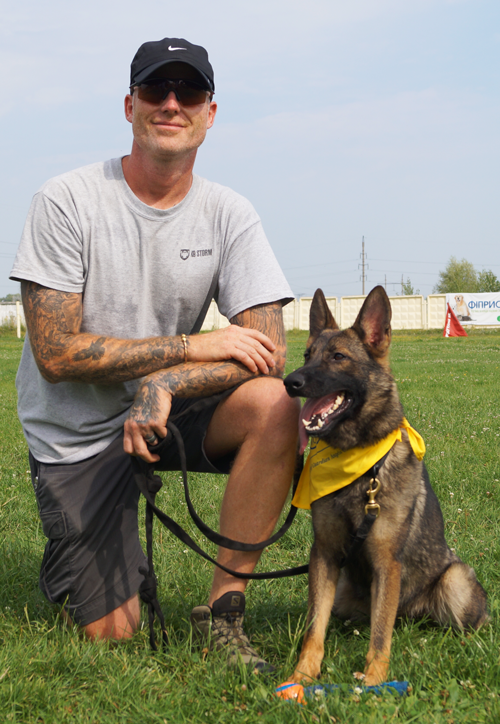 The Canadian trainers were impressed by how much Anatoliy was able to train the dogs to do in such a short time frame – usually only a few weeks – given the pressing urgency of the situation. But they also noted that due to the necessary rush, the dogs were not trained to their full potential, and much work still needed to be done to bring the canines to the training levels of their canine-counterparts in the Canadian, American, and other NATO forces. 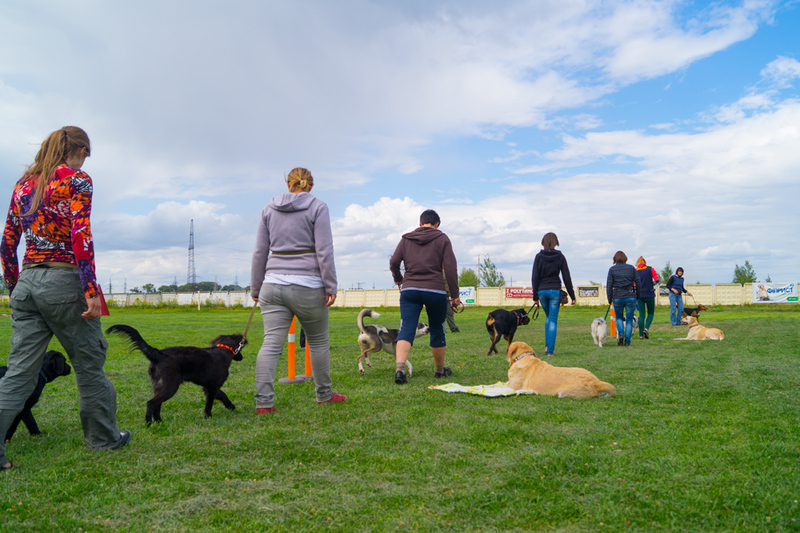 The following weeks were filled with intensive training, selection of dogs, and selection and training of trainers to run the program in Ukraine. “The resolve [of the Ukrainian trainers] to provide assistance to the soldiers was so inspiring that I couldn’t help but not want the day to end as we were doing so much,” said Lohnes. It did not take long before the Hero’s Companion project began to get noticed. With our therapy dogs we paid several visits to the Central Military Hospital in Kyiv as well as the Military Hospital in Irpin. Our first visit was at the Central Military Hospital. Initially we were only allowed in outdoor, common places, so we improvised and put on a sort of show with some of the dogs that were at the training centre. At the same time, the therapy dogs (and two of our service dogs in training) wandered among the crowd of gathered soldiers and their caregivers. It was truly special to witness the almost immediate effect the dogs had on the soldier-patients. First, their curiosity would encourage them over to us, wanting to pet the dogs and inquire as to what we were doing there. This would give us an opportunity to talk about Hero’s Companion, the service dogs, and how they could help those suffering from injuries such as Post-Traumatic Stress Disorder (or “Post-Traumatic Stress Injury,” as it is referred to by Courageous Companions). Oftentimes the soldiers would spend more than a few minutes with us, petting the dog, playing with it, and just being present near it. And in just that short period of time, more often than not you would see a smile slowly start to appear on their faces, accompanied with a more open, engaging, attitude. 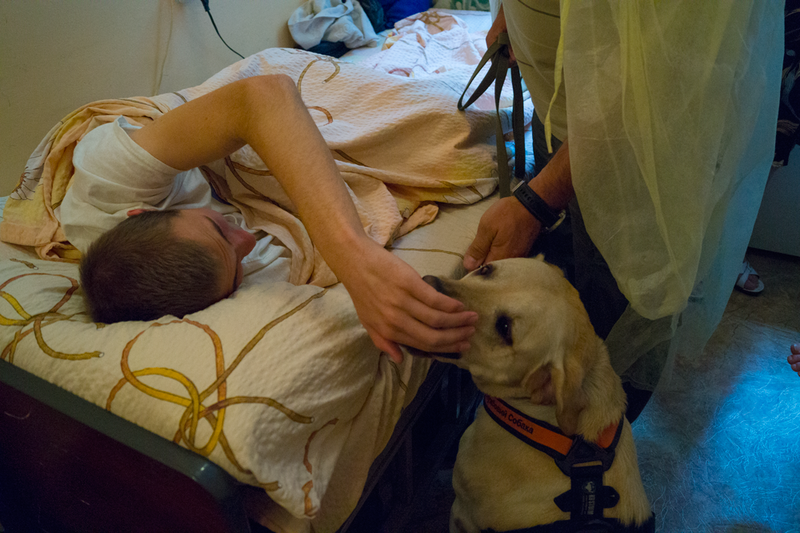 The dogs, in effect, provided a safe, neutral, and appealing subject for both the patient and volunteer to connect over – a connection with the potential to bring much needed help with treatment and rehabilitation of psychological injuries. Our first visit at the Kyiv Central Military Hospital was a big success. Despite the short notice, large numbers of soldiers and volunteers had shown up – and stayed – throughout the entire event. We were even told that celebrities who would come to perform for the soldiers did not usually receive such a big turnout. The Hero’s Companion team’s third visit to the Kyiv Military Hospital solidified for us the role and reason behind the program. During this visit we were granted access into one of the hospital wings and were able to meet with patients who were not able to leave their beds. Only a small group of us went in: Marc, myself, one of the first Hero’s Companion veteran participants, Volodymyr, and his dog Gera. 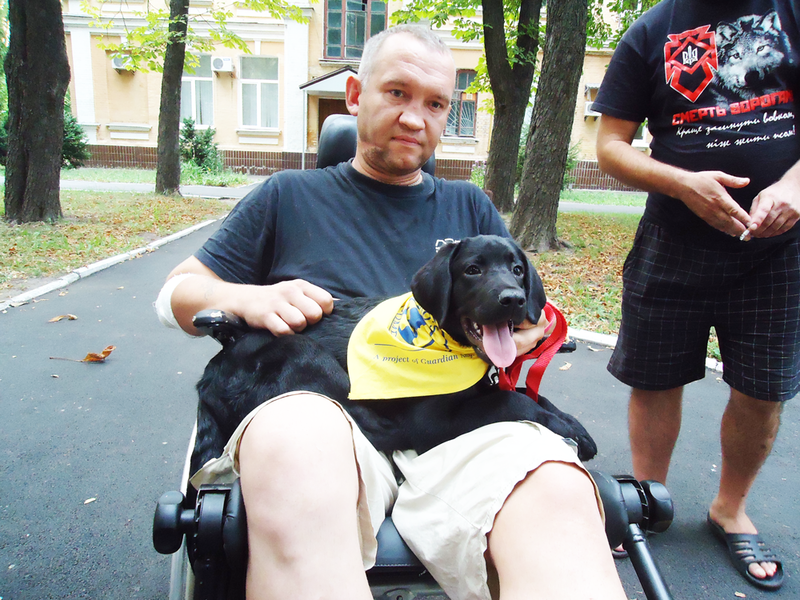 Volodymyr had served on the front for a year with the Ukrainian Armed Forces, and before the war had worked as a psychologist with children with special needs, and Gera had worked by his side as a therapy dog. 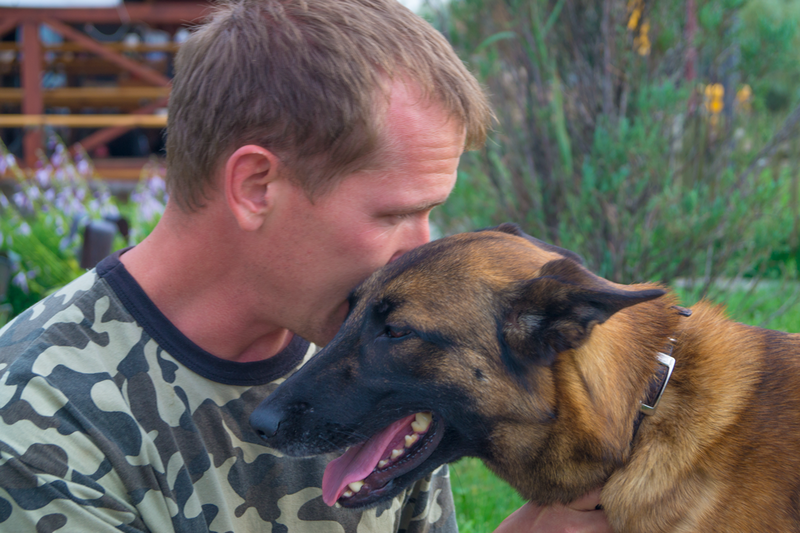 Now the two will continue to work together, as Gera is being trained to be Volodymyr’s service dog and help him with injuries sustained while at the front, including a traumatic brain injury and several concussions. Upon entering the hospital we were shown into a room with four soldiers in it. One of them, a leg amputee whose hands were also disfigured, was obviously closed off and detached from those around him, barely looking away from the wall in front of him. As we began talking about the program, the dogs, and how one could get involved, Gera, as if sensing that he needed help, went up to him and started licking his remaining leg. She then lied down next to his bed where she stayed for the rest of the time we were there. Eventually, the amputee took interest in her, first turning around to face her, and then petting her with his leg. Something so small, yet so significant. As we were walking through the hospital grounds back to our bus a soldier came up to our small group exclaiming, “Hey, Gera!” We turned to Volodymyr a little puzzled, asking if he knew this man. “Oh no,” the soldier replied, “I recognized Gera from the news reports!” Continuing on, we also ran into a few of the “regulars” from our previous visits to the hospital. “Hey Chief! Did you miss me! ?” one said, smiling, reaching for the puppy’s floppy ears. It was evident we – or more accurately, the dogs – were quickly becoming favourite visitors. By the end of the first mission we were receiving multiple phone calls, e-mails and requests from all over Ukraine. 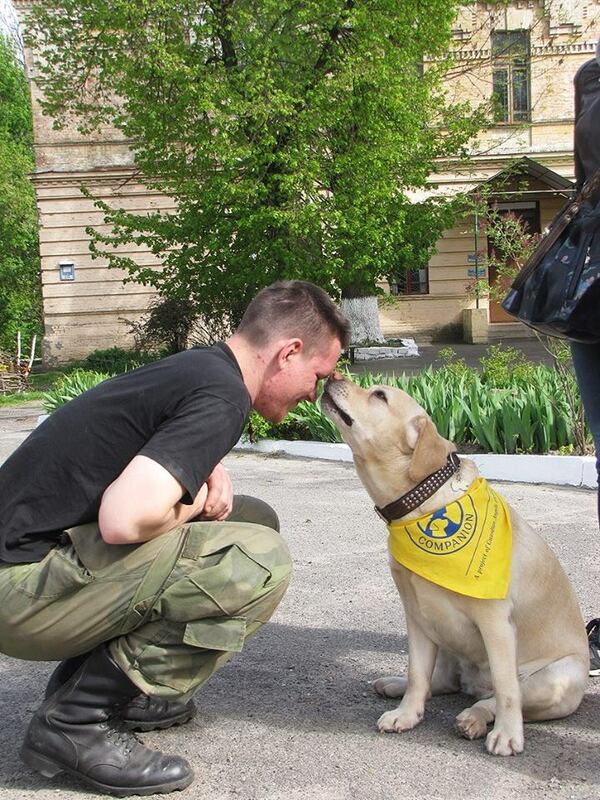 A military training base in Zhytomyr had heard about the program and asked if we could bring the dogs over, as many of the soldiers there had experienced the grim realities of war, including intense fighting while defending the Donetsk airport. It was clear that the Hero’s Companion program needed to grow and expand as quickly as possible, as the demand for therapy dogs especially was increasing every day. While the Hero’s Companion project was off to a good start, everyone involved was well aware that there would be many challenges on the road ahead. Laws need to be enhanced for persons with visible and invisible disabilities requiring the assistance of service dogs, awareness needs to be raised amongst the general population as to what a service dog is and how they can help veterans, and access to public places such as restaurants, shopping malls, and theatres needs to be secured for those working with service dogs. Perhaps most importantly, however, Hero’s Companion must strive towards building trusting relationships with the soldiers and veterans it was established to serve. In its beginning stages the project has had success in this regard, but it hasn’t been without its challenges. One evening, for example, after one of our visits at the hospital, we drove to a subway station in downtown Kyiv to meet a soldier who was supposed to have come by train from Dnipropetrovsk. As it turned out, the soldier had never even made it to the train, as he had gotten drunk that evening and last minute had decided not to take part in the program. In another instance, a 23 year old girl who had volunteered as a medic at the front and was training to be a sniper had lost both of her legs and as a result was overcome with depression, not wanting to talk to anyone. One of the volunteers who worked with her found out about Hero’s Companion and asked us to come and try to talk her into at least coming to have a look at the training centre, as she had not left her hospital room for days. It was decided that two females would go in and try speaking with her, but when we arrived she did not want to talk to us, and would not allow us into her room. We tried again twice after that day, to no avail. These kinds of difficult realities are faced daily by healthcare professionals, families, and volunteers across Ukraine when it comes to the physical, and especially psychological, rehabilitation of soldiers. The stigma surrounding mental health issues in Ukraine remains strong, albeit the barriers are starting to fall with an increasing understanding and acceptance of the importance in seeking out help. The reluctance to openly talk about psychological injuries such as PTSD was witnessed on a regular basis with the soldiers we dealt with; no one would openly acknowledge their struggle with this newfound, internal enemy, but there was a quiet, unspoken understanding that it was a hellish reality weighing down on them. But where there are great challenges, lies great opportunity. Hero’s Companion has the potential to help positively change Ukrainian society, especially those who have been injured while defending its freedom. As Lohnes remarked, “Even if we help save just one person, this project will be worth it.” But I am confident that Hero’s Companion will save and bring comfort to not only one person, but many, many more people. Moving forward, the project will be focused on bringing two to three trainers from Ukraine over to Canada for one month of intensive training. One of the goals of Hero’s Companion is to have the program be self-sustaining and self-reliable as soon as possible, and this “training of the trainers” will be a key component in reaching that objective. 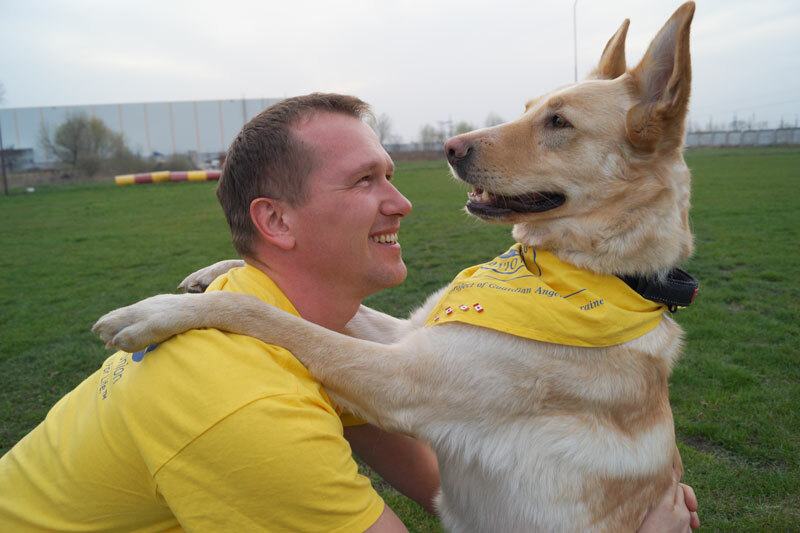 In Ukraine efforts are also underway to expand our therapy dog program to as many regions as possible, in order to reach a maximum number of hospitals and soldier-patients. Looking back at our first mission in Ukraine, it is rewarding to think of all that we were able to accomplish in just three weeks. While the road ahead might not necessarily be easy, the team is looking to the future with hope and anticipation, determined to help Ukrainian soldiers and injured veterans in a new and exciting way. 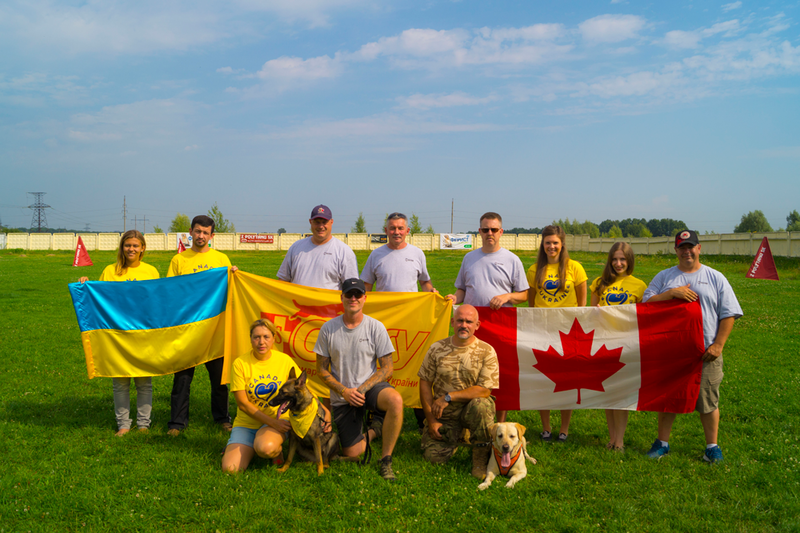 In just a few days four Canadian trainers will be heading to Ukraine for the launch of the Hero’s Companion project, the first project of its kind in Ukraine. We thought we would take this opportunity to introduce the members of the inaugural mission! 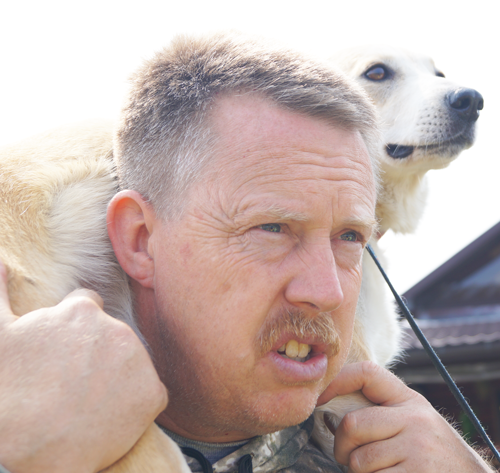 Marc is the National Program Director for the Courageous Companions Program and sits as a member and as a retired Canadian Forces Captain of the MSAR Service Dog Master Trainers. He is a devoted advocate for human rights and wellness, particularly war-affected military veterans. Throughout his infantry military career, Marc served in staff, training, and command positions throughout North America, Europe, and the Middle East. Rising in rank from simple soldier in 1990 to the rank of Sergeant in 2003, he was then commissioned as an Infantry Officer to the rank of Captain in 2005. Marc retired in 2014 after 25 years of service. Most notably, Marc was appointed as the Liaison Officer for Canadian Operations conducted on a NATO mission and in volatile areas of Afghanistan during the 2006-07 full-fledged combat operations against anti-government elements. His courage, strength, and leadership during this mission earned him the Sacrifice Medal as well as personal consequences. Marc’s dog training background is all hands-on skills and studies for over 30 years. He joined the Courageous Companions program in 2013, and since then has trained two dozen medical PTSI (Post-Traumatic Stress Injury) service dogs. He is committed to fellow victims of Post-Traumatic Stress Injuries. Cpl. 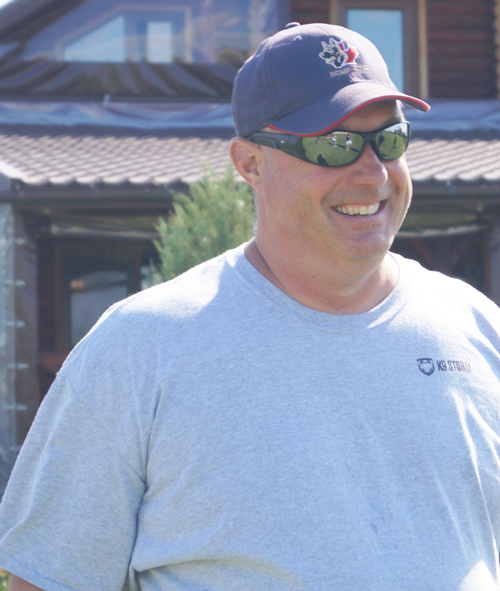 Chris Lohnes has been a member of the Royal Canadian Mounted Police (RCMP) since 1987, and entered the Police Dog Service in 1996. Chris has been heavily involved the RCMP puppy raising program and has worked with dogs from the ages of eight weeks old to adult dogs. He has personally gone through training a police dog seven times, which is a very demanding program within the RCMP. Chris started a unique program under Courageous Companions where he involved the Society for the Prevention of Cruelty to Animals (SPCA), Sacred Heart High School, the Yorkton Legion, the Yorkton Rotary Club and members from Yorkton RCMP Detachment. The program involves screening dogs from the SPCA and using students attending the high school to help familiarize and socialize the dogs. This program was very successful with a large number of puppies going through the program and being involved in full- service or supporting roles for the soldiers and veterans. Chris enjoys being involved, working with, and screening dogs for the Courageous Companion program. Stuart is a certified service dog trainer with Courageous Companions. He has been training dogs for the better part of 30 years. In that time he has trained numerous dogs to accomplish a wide variety of tasks, including: scent detection of narcotics, explosives, bed bugs, arson, human remains – basically, if you can hide it, he can train a dog to find it! Stuart has also worked to train and consulted on the training of police dogs across Canada and the United States. Over the years he has developed a very good skill set for working with personal protection dogs and developed a very high standard for training such animals. Stuart joined the Army Reserves in 1997 and recently retired in August 2014. During that time he volunteered for deployment to Bosnia in 2003, Afghanistan in 2007, and Afghanistan again in 2009-10. In his time with the Military he held a number of leadership and command positions both domestically and internationally. His biggest accomplishments and pleasure had always been leading and educating young soldiers under his command. In 2012 he was awarded a national citation for a Mention in Dispatch that is noted on the Governor General’s website. Stuart strongly believes that by assisting his fellow soldiers and first responders, a huge, positive difference can be made in their lives. Welcome to Hero’s Companion! Currently our project team is working hard preparing all of the groundwork for the First Phase of the project in August 2015. This phase will see four Master Trainers from Courageous Companions travelling to Ukraine for a 3 week mission. This mission will begin the “training of the trainers” in Ukraine, and will also begin the pairing process between service dogs and veterans. In particular, the mission will serve to assess volunteers for training to become Master trainers; will assess and assist in the selection and training of rescue dogs for the purpose of the program; and, will incorporate veterans and currently serving soldiers into the training process so that they may become Trainers and Master Trainers. During this mission trainers from Canada will be meeting with medical professionals, psychologists, and academics to discuss and co-ordinate the selection and incorporation of veterans into the Hero’s Companion program. The Canadian trainers will also consult with the research team, headed by Dr. Sergey Bogdanov at the National University of Kyiv-Mohyla Academy, who will be conducting an important study based on the Hero’s Companion program on the effectiveness of psychiatric service dogs in the treatment of PTSD among veterans. But before the team leaves for Ukraine there is a list of things that must be done, such as preparing course materials, identifying and recruiting participants to the program (both potential trainers and veterans, which are often one and the same! ), preparing promotional materials, arranging logistics for our stay in Ukraine, and ordering necessary equipment such as training vests for the dogs which identify them as service dogs/service dogs in training. The vests alone cost $6,500! At this time Hero’s Companion is also heavily focused on fundraising, as without funds the project will not be able to take off. While every effort is being taken to keep costs at a minimum, necessary expenses such as airline tickets and equipment bills certainly add up quickly. So spread the word! The entire team at Hero’s Companion would be very grateful not only for your financial support, but also for your help in getting the word out about the project. W e at Hero’s Companion firmly believe that this project is an ideal example of Canadians working in partnership with international allies to bring about a greater good. Canada’s relationship with Ukraine has always been a strong one, and has only become stronger since Ukraine’s EuroMaidan Revolution of Dignity began in 2013. In many ways, Canada, its government, and its people, have been steadfast supporters of Ukraine as it faces some of the most challenging times in its recent history. The Hero’s Companion Project will only serve to strengthen the bond between our great nations, and will further demonstrate the boundless good that can be achieved when we work together.